What's in a name? Not a lot, it would seem, at least as far as cryptozoological reports are concerned. Take, for instance, the intriguing yet lately-forgotten controversy surrounding the mysterious 'serpent' killed by Christopher Columbus during his first voyage to the New World. 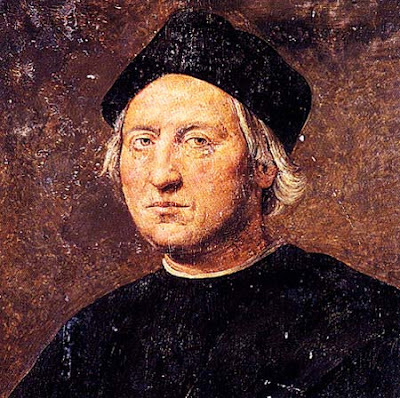 In his diary entry for 21 October 1492, Columbus reported killing and skinning a 'serpent' measuring almost 5 ft long that he had seen entering a lake on the Bahamian island which he later dubbed Isabela. Another of these 'serpents', of similar size, was killed at a different lake on that same island a day later, this time by Martin Alonso Pinzon - the captain of one of Columbus's ships, the Pinta. Regrettably, the skin of Columbus's serpent does not appear to have been preserved, which is a great pity, bearing in mind that zoologists have never been able to identify its species. Indeed, for a long time the prevailing opinion was that the creature was not a snake at all, but was instead a giant iguana. Unfortunately, however, as pointed out by Florida State Museum's assistant curator, Bill Keegan, in a fascinating Schenectady Gazette report (12 October 1987) concerning this cryptozoological conundrum, the iguana identity is far from satisfactory. Iguanas do not tend to enter lakes as a rule, and there was no fossil evidence for the erstwhile existence of such creatures on this island. Also, in his diary Columbus used the word 'lagartos' when referring to lizards, and 'culebra' for a snake, whereas he called the type of beast that he and Pinzon killed a 'sierpe' or serpent. In bygone days, the word 'serpent' had a much broader meaning than its more limited present-day usage as an alternative name for a snake. Indeed, it was often utilised as a general term for anything large and reptilian - including big snakes, lizards...and crocodiles. However, the reason why a crocodile had never been offered as a candidate for the identity of Columbus's 'serpent' was that no physical evidence existed to suggest such animals had ever inhabited the Bahamas - until 1987, that is. When Keegan led an archaeological expedition that year to Isabela, they examined the ruins of a village believed to have been visited by Columbus - and there they unearthed the left femur (thigh bone) of a crocodile. The bone was 3.5 in long, indicating that the entire crocodile had measured around 4 ft long. So despite the fact that there are no crocodiles here today, it would seem that in Columbus's time these reptiles did indeed exist on Isabela - and that one such creature had suffered a grim fate at the hands of this now-famous explorer. "In November 1936, the carcase of a 24-foot-long elephant-headed sea monster with white fur and a 14-foot tail was found on Alaska's desolate Glacier Island. Yet despite being examined by a team led by W.J. McDonald, supervisor of the Chugach National Forest, its remains were not preserved, and its ultimate fate is unknown." "As I noted in From Flying Toads To Snakes With Wings (1997), which also contains coverage of Trunko, in November 1936 the carcase of an elephant-headed, white-furred, long-tailed sea serpent measuring 24 ft in total length was discovered on Alaska’s desolate Glacier Island. This time, moreover, its remains were examined, by a team led by Chugach National Forest supervisor W.J. McDonald, but no news of their findings has ever been released, and, as with Trunko, the Glacier Island sea serpent’s remains were not retained." Not long after that book was published, I read a very brief note somewhere online that the examination of this carcase had in fact revealed it to be that of a minke whale Balaeonoptera acutorostrata, but no further information was provided. 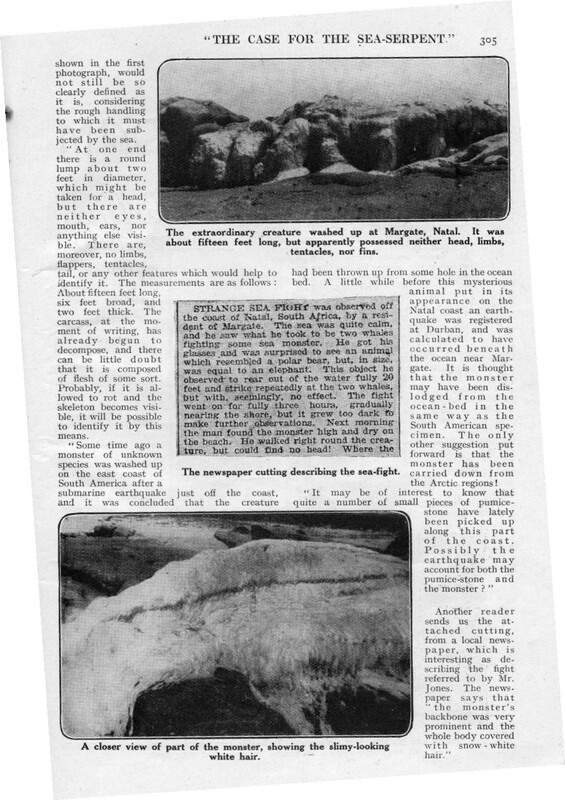 Thanks to two documents (one hitherto-unpublicised) kindly made available to me yet again by longstanding German correspondent and Trunko co-investigator Markus Hemmler, however, I am now able to reveal here, for the first time in any cryptozoological publication, not only the complete history of the Glacier Island Trunko carcase but also its conclusive identification and current location (complete with museum catalogue number!). The first of these two documents is an article dated 2 May 2008, written by Dixie Lambert, that was published in Alaska's Cordova Times newspaper. In it, contradicting earlier accounts (including my own), the date of the carcase's discovery is given as 10 November 1930, not 1936, and it was found floating on its back in Glacier Island's Eagle Bay amid icebergs from the Columbia Glacier by fox farmer Jerry O'Leary and his employee Charles Gibson. The only flesh remaining on it was confined to the mostly-intact mid-section; the head and tail were totally denuded. After they had towed it to shore, they chopped off the flesh, to use as fox bait. They also saved the skeleton, whose total length (including the skull) was said to be anything from 27 ft to 42 ft, and which was distinguished by its long tail and unusual flat, triangular head. The men speculated that perhaps it had previously been entombed within the Columbia Glacier before breaking off and floating away. "Its snout or beak from the tip to the center of the forehead was 3 feet 3 inches with a width of 11 inches at midsection and a circumference of 29 inches. Only the upper left jawbone was found, and it was described to be devoid of teeth. "The head was 4 feet 7 inches long and 3 feet wide at the widest part. The body section from the back of the head to the end of the rib cage was 6 feet 2 inches, and the tail was 14 feet long. The head attached directly to the torso with no visible neck. The skeleton's flippers were 3 feet 11 inches long with an average width of 8 inches. "The width of the skeleton at its widest part was 3 feet 2 inches, not including the flippers. It contained 37 vertebrae and it was thought that the skeleton was missing a few on the tail." "Alaska's Prehistoric Monster – Millions of years old. Nearly 30 feet long. Baffles the scientific world. Queerest monster ever found. Discovered in Columbia Glacier. Now on Exhibit. Here for a short time. Don't miss it. 25 cents Adults, 15 cents, children any time." "I was able to confirm that the skeleton is in storage at the museum and has been identified as that of a minke whale. It is said to be one of better specimens owned by the museum and has been made available to researchers from around the world." Nevertheless, just like the Wide World Magazine article from August 1925 that contained two photographs of the beached Trunko carcase, documented by me in my previous blog, its public existence has somehow managed to remain undiscovered by cryptozoological investigators and chroniclers for decades - until now. Verifying its continuing presence at the National Museum of Natural History, the second document sent to me by Markus Hemmler is a listing of this specimen's details as recently prepared by the Museum's Department of Vertebrate Zoology, which confirms that the skeleton (including its skull) is retained here, its original collection date was indeed 10 November 1930, and its National Museum of Natural History catalogue number is USNM 256498. Another mystery beast is a mystery no longer! TRUNKO - TWO MORE PHOTOGRAPHS!! Hot on the heels of my last blog re Trunko, which documented a hitherto-unpublished Trunko photo (one of three snapped by the photographer in question), here is a second Trunko world-exclusive! Thanks once again to the indefatigable efforts of my Trunko co-researcher Markus Hemmler, and also, independently, to the greatly-appreciated assistance of Paranormal Magazine editor Richard Holland (who owns a sizeable collection of the following publication), I am delighted to be able to present here an article published in August 1925 by Wide World Magazine that contains a detailed historical and eyewitness account of Trunko written by that same photographer, Mr A.K. Jones (named as Mr A.C. Jones in my previous blog because that was how he was referred to in the Margate Business Association website containing the Trunko photo by him that I blogged about previously), and which contains his other two Trunko photos! Please note that these photos are copyright to Mr A.K. Jones, and are presented here within the Wide World article solely for review/scientific critique purposes in accordance with the Fair Dealing/Fair Use convention on a strictly non-commercial basis. So enjoy the article, and the Trunko photos, which in my view now make it absolutely certain that Trunko was indeed a globsterised whale carcase, and therefore was never alive in the oft-depicted exotic form of a white-furred, trunk-bearing, lobster-tailed marine cryptid. 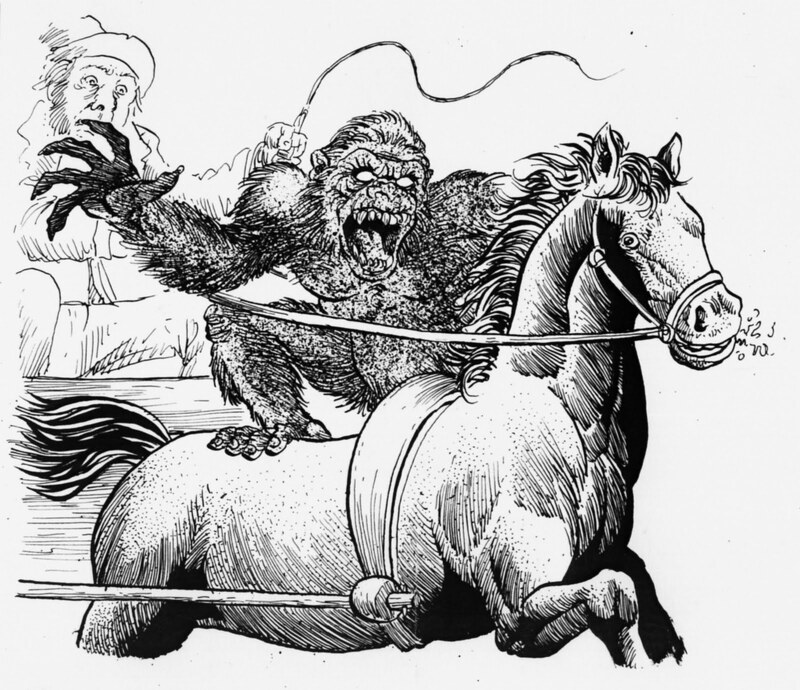 To think that this article has been publicly available for 85 years, yet until now no-one in the cryptozoological or wider Fortean community had known about it! 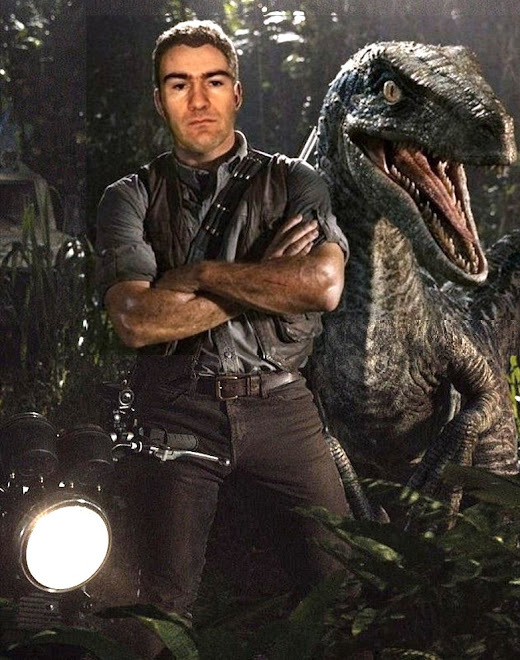 Suddenly, the prospect of the missing thunderbird photo no longer seems quite so unlikely after all! As before, my most sincere and grateful thanks to Markus Hemmler (http://www.kryptozoologie-online.de/) for sharing his momentous finds with me. 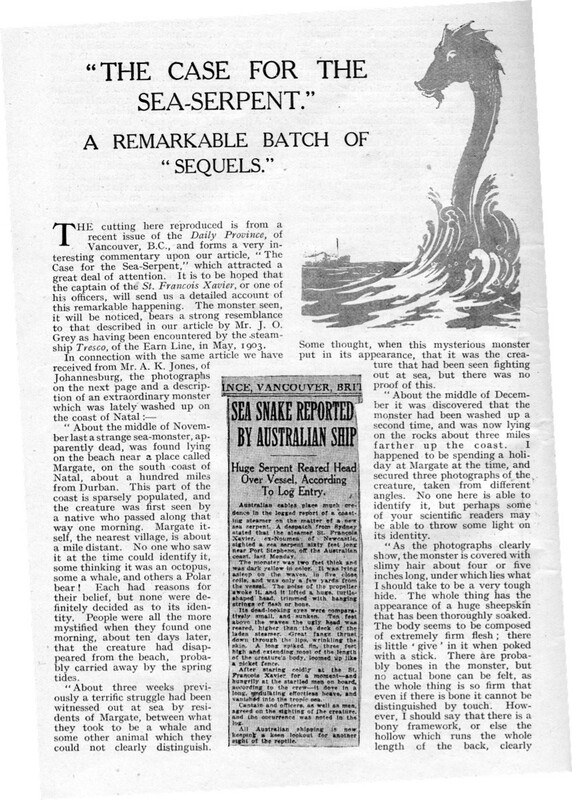 One of the most bizarre cryptids ever reported was the huge white-furred trunked sea monster that was allegedly observed from the shores of Margate, South Africa, by several eyewitnesses one day during the early 1920s (the precise date differs between accounts - see below) as it battled two whales out to sea for several hours before its lifeless 47-ft-long carcase was later washed up onto the beach, where it lay for several days before the sea took it back out, never to be seen again. During those several days, however, not a single scientist bothered to venture forth to examine or even observe this extraordinary creature's remains. Nor had its remains ever been photographed...or so I had always assumed - until now! Yesterday, German correspondent Markus Hemmler emailed me with some remarkable news. He had discovered a website containing an allegedly genuine photograph of Trunko - a monicker, incidentally, that I had somewhat lightheartedly given to Margate's mystery sea monster in my book The Unexplained (1996) but which, to my great surprise, has since become its accepted name. Moreover, the photograph had been snapped by none other than Mr A.C. Jones of Johannesburg - the correspondent and photographer for an article on this entity that had been published in the Rand Daily Mail and also in Wide World Magazine way back in July 1925, thus providing a promising air of authenticity to the image. In his mighty tome, In the Wake of the Sea-Serpents (1968), veteran cryptozoologist Dr Bernard Heuvelmans defined and delineated the truly protean ‘great sea serpent’ to yield no less than nine morphologically-discrete taxa of sea serpent, which included various currently-unrecognised species of pinniped, cetacean, fish, reptile, and possibly an amphibian. However, at least one marine mystery beast included in his book appeared so bizarre that even Heuvelmans – “the Father of Cryptozoology” - was at a loss as how best to categorise it, and so, after briefly describing it, he simply omitted it entirely from his great scheme of sea serpent classification. Known officially as the Margate sea serpent or more colloquially, in recognition of one of its most distinctive characteristics, as Trunko, this truly anomalous animal made its debut on the morning of 1 November 1922 [also variously claimed in some sources to be 25 October 1924 or 2 November 1924]. That was when, according to subsequent local newspaper reports, South African farmer Hugh Ballance looked far out to sea from the beach at Margate, Natal, and saw an amazing spectacle. With the aid of glasses, he could perceive what seemed to be two whales fighting with a huge sea monster, resembling a gigantic polar bear on account of the fact that it appeared to sport a dense snow-white pelage. According to Ballance, who was joined by an ever-increasing crowd of observers as the formidable battle continued, the creature reared fully 20 ft out of the water and struck repeatedly at the whales with what Ballance assumed was its tail - but to no effect, because after 3 hours the whales moved away and their furry attacker floated lifelessly at the surface. 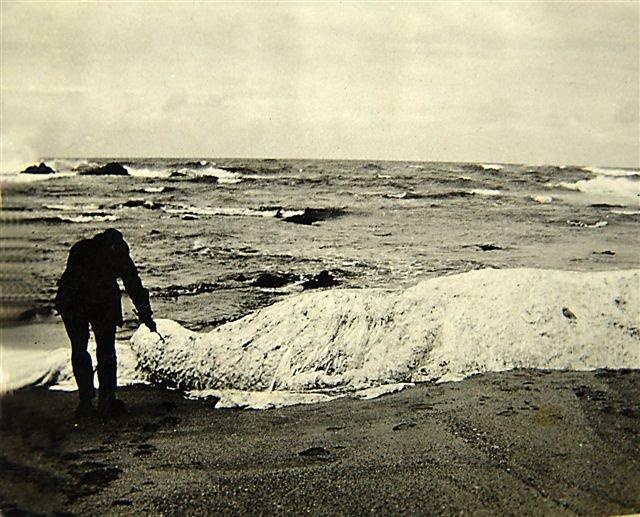 Later that evening its dead carcase was found washed ashore, and was seen to be of colossal size, roughly 5 ft high and measuring 47 ft in total length, which included a 10-ft tail at one end (said in some later reports to be lobster-like), and, incongruously, an elephantine trunk at the other – in place of a head! This extraordinary structure was approximately 5 ft long and 14 in across, and its tip resembled the snout of a pig. Even more noticeable, however, was its luxuriant covering of fur or hair, 8 inches long, and, at least in Ballance’s view, exactly like a polar bear’s, yet with no sign of blood anywhere, despite the ferocity of the earlier sea-battle. Incredibly, however, despite the huge number of onlookers that it attracted (some of whom brought in a team of 32 oxen to move it seaward, which they failed to do on account of its immense weight), and despite the fact that its corpse remained beached for 10 days, becoming ever more odiferous as decomposition set in, no scientist came to observe or to take samples from it for study. On the evening of the tenth day, the tide took it back out to sea, and the chance to investigate one of the most astonishing zoological secrets of the sea was lost forever. All that we can do today, therefore, is speculate on what Trunko might (or might not) have been (always assuming, of course, that it was not a newspaper hoax). Certainly, based upon its description taken at face value, this supremely strange ‘marine elephant’ does not correspond with any known species of animal alive today or known from fossil remains. But perhaps there is more to its description than initially meets the eye, harbouring cryptic clues that may shed light on this otherwise decidedly shadowy mystery – a mystery, moreover, that is generally passed over or totally ignored even in the majority of cryptozoological publications. However, one detailed and highly intelligent assessment of Trunko that does exist is by cryptid chronicler Lance Bradshaw, and it can be accessed on his Kryptid’s Keep website (http://www.angelfire.com/sc2/Trunko/trunko.html). In his discussion, Lance raises several valid, important points worthy of consideration here. Take, for instance, Trunko’s unique pelage. It has already been noted in this chapter that dead sharks can acquire, via the pseudo-plesiosaur effect, a covering of ‘hair’, which in reality is nothing more than connective tissue fibres that become exposed during decomposition of the carcase. However, if Ballance’s testimony is to be believed, Trunko bore its snowy fur while it was still very much alive, battling the whales. If this is true, then clearly its fur cannot be explained away as exposed connective fibres. Moreover, it also suggests that Trunko was mammalian, albeit wholly unlike any mammal previously recorded by science. Yet this is not the only mystery associated with its fur. As Lance has pointed out, exclusively marine mammals, such as cetaceans, are not furry, because this would hinder their mobility. Conversely, marine creatures such as pinnipeds and polar bears, which are furry, do not spend their entire lives in the water. Consequently, if Trunko’s fur were a genuine feature of its morphology, this suggests that it must venture ashore sometimes. Yet as it was apparently limbless, but stupendous in size, how could it accomplish such a feat without becoming fatally beached, probably suffocating under its own weight, as beached whales so often do, even species much smaller than Trunko? Then there is the equally odd matter of its trunk and supposed headlessness? Unless the head were so small that it imperceptibly graded into the trunk, how can Trunko’s acephalous condition be explained? The most reasonable solution is that the trunk was actually a neck, from which the head had become detached following the creature’s death. Yet as with its fur, Trunko was seen to possess a trunk with no head at its distal end while still alive. Or was it? Trunko’s anomalous features are anomalous primarily because they were exhibited by Trunko while still alive, not just when it was dead. But was Trunko ever truly seen alive? The great battle with the whales took place some distance out to sea, not at the shore. Could it be, therefore, as postulated by Lance, that Trunko was not alive at all – that what was actually being seen by Ballance and the other observers on the beach was two whales tossing an already-dead carcase back and forth, playing with it just like killer whales, for instance, which are known for frolicking boisterously with their food, often throwing seal victims up and out of the water? During such exuberant activity, Trunko’s head may have been ripped off and eaten or lost, and possibly some heavy chafing of its skin might conceivably have yielded a shredded surface of exposed connective tissue fibres. Perhaps the carcase was that of a decomposed shark, with the pseudo-plesiosaur effect creating its neck-like trunk and fur. Alternatively, it may even have been a globster - a quasi-octopus complete with hairy surface and a false tentacle resembling a trunk, engendered from the remains of some long-dead ‘globsterised’ whale. This, incidentally, as Lance has noted, would also explain the otherwise-anomalous lack of blood present when the carcase was washed up. A recently-dead mammal that had battled two whales, in contrast, would have been covered in wounds pouring with blood, or at least stained with it. Instead, Trunko’s snowy pelage was apparently immaculate, with (to quote Mack the Knife!) never a trace of red. Having said that, I am not wholly convinced that even the above-described activity could yield the exceptionally distinctive snow-white pelage described for Trunko both while at sea and while beached, but at least the enigma of this creature’s hitherto unclassifiable morphology is now beginning to look a little less impossible than before. Nevertheless, with no physical remains to examine, the only hope of ever resolving this longstanding cryptozoological case satisfactorily is for another Trunko specimen to turn up one day, and for it this time to be treated with the scientific interest and rigour that it deserves. Interestingly, the prospect of a second Trunko appearing may not be as remote as it may seem. In fact, it may already have happened. 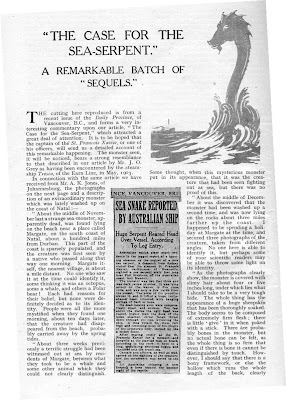 As I noted in my book From Flying Toads To Snakes With Wings (1997), which also contains coverage of Trunko, in November 1936 the carcase of an elephant-headed, white-furred, long-tailed sea serpent measuring 24 ft in total length was discovered on Alaska’s desolate Glacier Island. This time, moreover, its remains were examined, by a team led by Chugach National Forest supervisor W.J. McDonald, but no news of their findings has ever been released, and, as with Trunko, the Glacier Island sea serpent’s remains were not retained. After a whale dies, its body can float for months, decomposing, until eventually its heavy backbone and skull dissociate from their encompassing skin-sac of rotting blubber, and sink to the sea bottom, leaving behind a thick gelatinous matrix of collagen - the tough protein found in skin and connective tissue. It is this mass of collagen, still encased in its skin-sac, that washes ashore, as a globster. Furthermore, if a few of the whale's ribs remain within the collagen matrix, and any 'fingers' of fibrous flesh are attached to them, these resemble tentacles. And if the whale is a sperm whale, the spermaceti organ gives the resulting globster a bulky shape reminiscent of an octopus. DNA tests that were performed on samples of the tissue from the huge Chilean globster washed ashore in June 2003 independently confirmed its sperm whale identity. All of which explains how a rotting whale can metamorphose with ease into a giant octopus - and also, it would now seem, into a surreal South African sea monster that had hitherto baffled the cryptozoological world for generations. My grateful thanks to Markus Hemmler (http://www.kryptozoologie-online.de/) for bringing this cryptozoologically-significant photograph to my attention. There is a pub in Smethwick, just outside Birmingham, in the West Midlands, England, called the Blue Gate that may lay claim to erstwhile cryptozoological fame. Mysteries researcher and author Nick Redfern now resides in the USA, but he formerly lived only a few miles from Smethwick, and on 5 November 2007 he gave me the following fascinating information - derived from the great-uncle of a friend, Eddie, of Nick’s father. Around the end of the 19th Century, Eddie’s great-uncle Ned was driving a pony and trap on Rolfe Street, Smethwick, late one night when he heard some strange noises behind him. Suddenly, a weird-looking animal leapt out at him, but he supposedly fought it off with his horse-whip. The creature was killed, placed in a glass case, and displayed in the Blue Gate pub on Rolfe Street for some time, where the locals dubbed it ‘Old Ned’s Devil’. Sadly, however, this mystifying specimen, for which no morphological description exists, apparently vanished years ago, and nothing more is known of it. Living not too far from this area, I have made some enquiries myself, but no-one has been able to add to the above details given to me by Nick. I also included an item on it in my Alien Zoo column for Fortean Times not long after I received the original information on it from Nick, but it did not elicit any response from readers. So at present this is where the matter rests – except for the intriguing fact that the general storyline of the Smethwick mystery beast’s attack upon Eddie’s great-uncle is very similar to that for another bizarre beast from that same bygone period, the Shropshire Union Canal man-monkey. As Nick has actually written a book about this latter beast, he is naturally particularly curious about the Smethwick equivalent, as indeed am I. Could the two stories stem from a single source, and, if so, how? Alternatively, were there truly two separate albeit very comparable incidents and, if so, what exactly was Old Ned’s Devil? An escapee/released exotic pet, possibly? Earlier this year, seeking to revitalise this dormant mystery, I emailed its details to Professor Carl Chinn, the leading historian of the Black Country - the longstanding nickname of the former highly-industrialised region of the West Midlands (deriving the name from the thankfully long-vanished black smoke belched out by furnaces, factories, and other industries here) encompassing Sandwell, Dudley, Wolverhampton, Walsall, and the outskirts of Birmingham (including Smethwick). Prof. Chinn was so interested in it that on 15 July he included a sizeable section documenting its history in his weekly Black Country history double-page spread in the local Express and Star evening newspaper and also in his pages in the weekly Sandwell Chronicle from the same week. He requested anyone with information concerning the Smethwick Devil to write in, but as yet there has been no reply. Nevertheless, at least the information has now been 'brought home', with its details having been made public in the very area where the events originally took place all those many years ago. After all, if there is indeed anyone out there who does know something, the Black Country is most likely where they will be. Having said that, however, if there is any ShukerNature reader anywhere who can contribute ideas, information, etc, please do get in touch!